37 pattern (shown below) and 40 pattern Battledress uniforms. 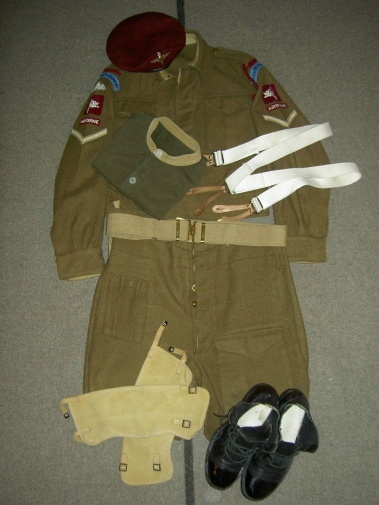 Walking out uniform; Hob nail ammo boots, battledress trousers and jacket, red beret with regimental cap badge, unblancoed web belt, gaiters, collarless shirt, and white suspenders. 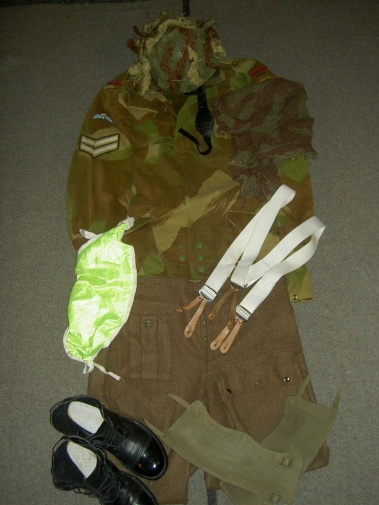 Field Uniform; Denison Smock, Sniper Veil/NeckScarf, flourescent recognition panal, airborne steel helmet, 37 pattern trousers or parachutist trousers, blancoed gaiters, and hob-nailed Ammo boots.